1.2 million myocardial infarctions occurred last year in the U.S., and 480,000 patients died following complications of infarction. Now, you can detect and treat the many complications associated with myocardial infarction in time to save many more patients. 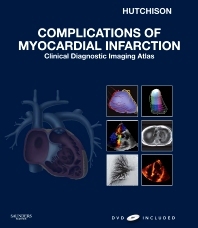 This title in the brand-new Clinical Diagnostic Imaging Atlas Series offers you authoritative guidance from a well-known cardiologist and imaging expert about when and how to perform the latest diagnostic imaging tests, interpret the results, and effectively treat the emergency. Detailed discussions of hot topics, full-color illustrations, and a DVD of procedural video clips, animations, and downloadable image libraries help you provide fast, appropriate treatment for each challenging case you face. Offers detailed advice on when and how to screen for the most prevalent but often difficult-to-diagnose complications of myocardial infarction to help you improve care and increase survival rates. Discusses the hottest topics in myocardial infarction, including cardiogenic shock • left ventricle remodeling • thrombi • right ventricle infarction • free wall rupture • false aneurysms • tamponade • ventricular septal rupture • papillary muscle rupture • and more that prepare you to better diagnose and manage whatever you see. Presents 70 fully illustrated case presentations with teaching points that make information easy to understand and digest. Includes a bonus DVD containing hundreds of video clips of techniques and animations that show you what to look for and how to proceed as well as downloadable image libraries for use in electronic presentations.